Once Upon a Blog: Can Beauty Sleep Get Ugly? Can Beauty Sleep Get Ugly? We all know that sleep is essential for overall health, not to mention avoiding circles that say, whoops, I stayed up all night watching Revenge. But that's not all. "Sleep allows the skin to restore its natural balance and increases the effectiveness of certain skin care ingredients," says dermatologist Elizabeth Tanzi. That means the concept of beauty sleep is no myth. But can you get too much of a good thing? Lately, I'm noticing sleep's not-so-beautiful side—literally. I’ve always slept on my left side, and now there’s a crease on that side of my face to prove it. I'll admit that I was warned by countless beauty mags about this—that's why some wrinkles are called "sleep lines," after all—but now that it’s actually happening, where can I draw (or erase, or at least stop) the line? You've probably heard of upgrading from cotton to silk or satin pillowcases, so that your face gracefully glides across the pillow instead of getting squished for eight (ish) hours straight. Maybe you've even tried the Save My Face pillow, a wrench-shaped support that keeps your face suspended all night. I have all of the above, but I still wake up with the same darn dent (it's always worse in the a.m.). Maybe I ditch that little wrench pillow halfway through the night, or shun the pillows—silk and all—and face plant into the mattress. How the heck would I know? I'm asleep! “Women, who tend to sleep on their sides, are most likely to see these lines appear on their chin and cheeks,” says the American Academy of Dermatology (ADD). “Men tend to notice these lines on the forehead since they usually sleep with the face pressed face down on the pillow.” According to the ADD, the best way to avoid sleep lines altogether is to sleep on your back. But at least for me, that’s easier said than done. Prompted by my research for this post, I’ve been trying to sleep supinely, only to end up counting sheep or eventually resuming the fetal position. 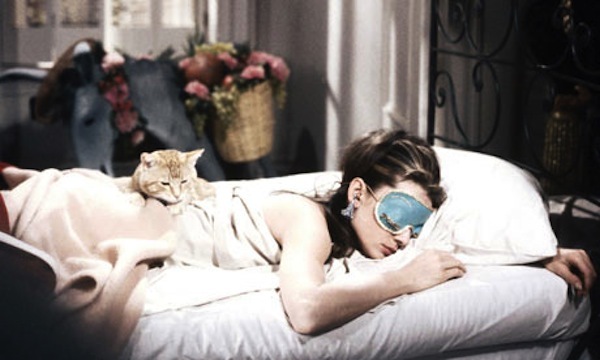 So ladies, when it comes to beauty, is it better to enjoy a deeper slumber on our sides, or get a less satisfying—but wrinkle-free—snooze on our backs? Does anyone have any tips for avoiding sleep lines, or unlike me, are you a sleeping beauty? Clearly my dog isn't very concerned about sleep lines. I was a stomach sleeper until I got pregnant and then started sleeping on my side with those Snoogle pillows. Now that my daughter is a toddler, I just don't sleep that often. My face wrinkles must be from something else! Best of luck with your pregnancy, Rachel! Rachel, thank you so much for the tip about sleeping with a pillow under your knees! I tried that last night and it was infinitely more comfortable! I didn't make it through the entire night on my back, but maybe I'll be able to get used to it! Bethann, the Snoogle pillow looks super comfy! Would it be weird if I got one?